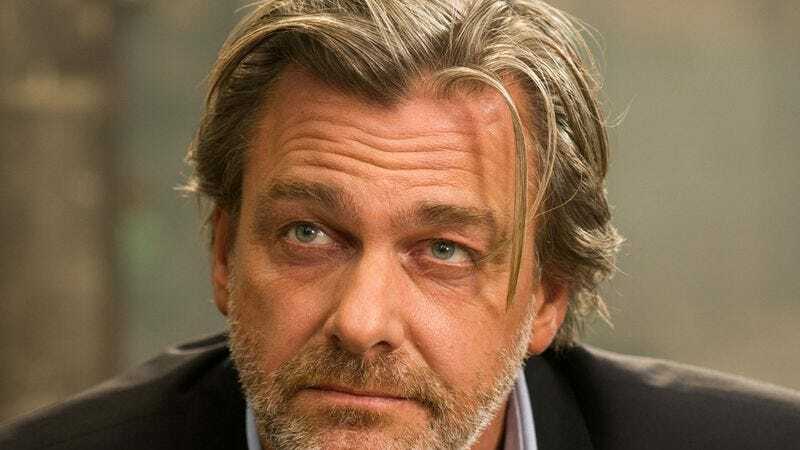 The actor: Ray Stevenson followed his dream of becoming an actor a little later than many of his peers, taking his first proper acting class when he was in his 20s. But he’s more than made up for it in the intervening years, proving his range by appearing in adaptations of classic literature (The Return Of The Native), turning up in two different Marvel franchises (Punisher: War Zone and the Thor films), showing his comedic side in The Other Guys, and showing just about everything else during his time on HBO’s Rome. Currently, Stevenson can be found within the cast of The Transporter Refueled, but he’ll be swashbuckling his way onto the small screen again to play Blackbeard in the new season of Starz’s Black Sails in early 2016. Ray Stevenson: I play Frank Senior, the father of the protagonist, Frank Junior, who’s played by a wonderful actor, Ed Skrein, who was on Game Of Thrones. It’s a refreshed reimagining of The Transporter where they bring this father-son relationship into the storyline, and I had tremendous fun playing it. He’s like an old spy, an old sort of MI-5, MI-6, or CIA type of Grey Ops character. Growing up, there was a distance between father and son through his work and being away all the time. So in this story these two men are bonding with each other and getting to know each other. In the middle of it, the Transporter gets embroiled in the revenge acts of some sort of femme fatale against some Russian crime lords, and his father gets embroiled in it as well. I thoroughly enjoyed playing it, playing opposite Ed, and working with everybody. We shot it in beautiful locations in Paris and Nice and Seine-Saint-Denis, in France, and I think it’s a great tongue-in-cheek, exciting roller coaster of a ride. The A.V. Club: Had you been a fan of the Transporter franchise before coming into the film? RS: Oh, yeah. I was a fan from the very first one, which I thought was a tremendous and fresh piece of work, a fresh movie with a fresh premise, and I thoroughly enjoyed all three with Jason Statham at the helm. I was delighted when hearing about this one, when they were saying that they were refreshing it, and that there was a place for me to potentially play this character. So it was a thrill. AVC: As a fan of the original films, do you think other fans would find it relatively easy to step into Refueled, given the changes at hand? RS: It’s a shift. It’s not trying in any way to step into Jason Statham’s boots or to be a sequel of those films. That’s a standalone franchise, those films, and will remain so. And this is a reimagining, a refreshed sort of look at the whole premise of the Transporter character and the world in which he operates. AVC: The answer here is probably a spoiler no matter what, but are you in a position to do further Transporter films in the future? AVC: It would appear that your first on-camera role that wasn’t a commercial was in The Dwelling Place. RS: Good grief! Yes, that was probably my first professional job, which I landed two weeks before leaving theater school. I went straight in to work, and it’s been a tremendous ride ever since. It was based on a Catherine Cookson book. She was a very prolific homespun writer from the northeast of England, writing dramas set in the late 19th century, early 20th century and around the mining communities and towns and workplaces and shipyards of Newcastle Upon Tyne, where I indeed spent many of my formative years growing up. And I had the great fortune of coming back to the series—on The Tide Of Life—and playing a character called Larry Birch as well, which was tremendous. So I have a rare position of actually playing two protagonists in Catherine Cookson dramas, which was a great privilege. I was very fortunate to do so. AVC: How did you find your way into an acting career? RS: It’s something I’d always dreamed about, and I’d always wanted to do it, but it didn’t seem at all possible or approachable. It was something that other people entered into, this world, so I just paid little leave—or tried to—and attempted to convince myself that it was nothing more than an alter ego. But the desire to get involved in this profession, and try to find out more about it, just wouldn’t leave me. So eventually, I was 25, I think, when I started going to an evening school, a bona fide theater school, and did two nights a week. And after two weeks it terrified me, so I knew I wasn’t going to have a choice. This wasn’t a decision. I had to take a leap and see what would be of it. AVC: Had you always had the mindset that you’d jump in front of the camera, or would you have been fine with sticking to the stage? RS: Always a mindset on camera. For some reason I was always drawn to movies. I never went to theater when we were young. I didn’t have that privilege, that access to go. So it wasn’t the call of the stage, as such, even though I ultimately ended up doing classical theater training, which was fantastic, and I’ve done quite a lot of stage work. It’s basically just being a jobbing actor, a consummate jobbing actor. They’re all disciplines within the field, and you bring all these factors with you no matter what you do. It could be voice-over work, it could be stage, TV, movies. I just find the whole process of each of them fascinating. RS: Good grief. [In a Yorkshire accent.] At Home With The Braithwaites. [Laughs.] Oh, my word. Yeah, that was a lot of fun. That was all filmed up in Leeds. It was already a successful series when I got brought in as sort of the erstwhile brother of one of the main characters. I got to dress well, I got to muck about a bit on a successful British TV show. I had a lot of fun doing that, yeah. AVC: Just about every guest star on Dexter ended up getting a death scene in the end. How did you feel about the way Sirko went out, assuring Dexter that there was still hope for him? RS: I think it was great. I think it added an emotional sophistication to the role, and to Dexter, to have such a reality check, but coming from such an obscure place, one where he never would’ve expected. Who else could Dexter ask that question to in his whole life? And this man was not going to tell him any lies. “Was it worth it?” “Absolutely.” And I think it impacted on his character. He was great to work with, Michael C. Hall. He’s a wonderful actor. RS: Oh, yeah. There’s a character and a half. [Laughs.] In the book, he’s supposed to be sort of… I don’t know, purple with pink lips or something. And I thought, “How can you make this vampire-y sort of character look different?” And I was talking to the makeup guys about I’d been watching this wildlife program about the Galapagos Islands—here’s how weird this thing reaches—and looking at the iguanas down there and how their skin is sort of scaly but there’s a pale blue and a pale yellow and pale greens, but they’re sort of like a dead pale blue, a dead pale yellow, and so forth. So the makeup guys were delighted to make up a semi-decaying looking, dead-colored flesh on him. There was also kind of a tool to sharpen my teeth and fingernails, but I said, “He’s got to look like he might’ve at one time possibly been one of the most dashing figures around town and in society.” So I put him in this turn-of-the-century Italian cavalry uniform, which was very dashing. And his swept-up hair would’ve been in a ponytail, and at the time it would’ve been perfect and rather Stewart Granger-esque. But, of course, now—250 years later—it’s all gone a bit south. It’s all a bit rotted. It’s all a bit decayed. But there’s that sort of decayed elegance that was still there, which actually adds to the menace of the man. It was a lot of fun to work on. AVC: So what did you think about the film’s ultimate reception? Because it was only one in a series of books, but we never saw any further adaptations. RS: Ultimately it fell foul of people not really getting a grip on exactly how to sell the movie, how to present the movie, because in the end they tried to fall in the middle ground. It tried to be as much of all things to all people and, ergo, was not really anything to much of anyone. Hindsight is a cruel mistress, but I do think it suffered from not really having a clear direction as to how to pitch it and how to sell it. And it is a tough sell, a movie that starts with a kid committing suicide while his family is around grieving because he wants to be a vampire. You just go, “Whoa, hang on, wait a minute, no matter what goes on after this…” And there are some very dark pieces in there, and some very dark characters. And yet it’s this sort of jaunty, carnival-esque piece. It’s not an easy sell. RS: Oh, wow, yeah. Nazi zombies: I hate those guys. [Laughs.] I’d just finished Rome, and my agent said, “Listen, there’s this ultra low-budget movie, they’re only shooting five weeks in Scotland. You’re probably gonna pass on it, but the director would love to meet you.” And I said, “Well, you know what? If the director himself wants to turn up, of course I’ll meet him for a chat.” So I met the director, and it struck me how much this guy is a geek of this world, and a fan of that particular genre, and how much invested he was in this piece. And at the end of the meeting, I said, “Well, I’d be delighted to try and make this come about and try to bring this to screen.” And, you know, I think they did a damned good job of it. And I had a lot of fun. I just wish I hadn’t been killed at the end, but there was kind of an inevitability to it. AVC: Apparently 2007 was the year of the zombie for you, since that was also the year that the pilot Babylon Fields failed to get picked up. RS: Babylon Fields, that’s right! We filmed that on Long Island. That was, I think, ahead of its time. Certainly ahead of The Walking Dead and things like that. But they went for the pilot. They committed to it. It was a lot of fun. But I doff my chapeau to them for having the gumption to go ahead and just go for it. AVC: They apparently did take another shot at it a year or so ago, but it didn’t take off then, either. RS: Well, with The Walking Dead and the genre having picked up so strongly since then… it’s hard to follow that. RS: Ah, The Other Guys! Two days before we started filming, the director calls me up, and he said, “I’ve had this idea, Ray: I think he should be Australian.” I went, “Okay! Okay, why not?” And what a gift, to work with Will Ferrell and Mark Wahlberg and Steve Coogan. It was hilarious. I mean, just watching these guys work… They’re just wired differently. [Laughs.] But I told the director, “I want him to be ex-Australian Special Forces,” and I put in the line when I threaten Mark Wahlberg’s character about, “There are three things I love in this world: wallabies, Kylie Minogue, and the quiver in a man’s lip just before I’m about to hit him.” I think I put in the Kylie Minogue bit because she’s such a gay icon—or she was at that time—and here was this ex-Special Forces Australian freelance security guy who just thinks Kylie Minogue is a goddess! So I was able to sort of squeeze that one past the goalposts. It was a lot of fun filming here in New York, where I am at the minute, but in wintertime, of course. Nobody gets away warm. But, yeah, it was just a great pleasure to work with those guys. AVC: You were one of the few actors in the cast who wasn’t known predominantly for their work in comedy. Did you find that challenging? RS: I love doing comedy! I always maintain that there’s humor in everything. I mean, a movie like that, it’s comedian-centric. They’re very comedian-led. And watching Will Ferrell and the rest of them, just the way they sort of fire and spark off each other, it was like going to school every day. RS: Oh, yes. [Singing.] “I’m just a gigolo / And everywhere I go…” That was Helen Bonham Carter working on that, and I think when I first met them for it, Ken [Branagh] wasn’t attached. And then Ken came onboard, and Paul Greengrass directed, so I got to work with the wonderful Paul Greengrass. It was only a couple of scenes, but they were quite a couple of scenes. But I thought it was a lovely premise as well, that this girl who was in an advanced stage of a motor neuron disease and wanted to get laid. And they tried to set her up with different dates, and she said, “No, no, no, you don’t realize: that’s not my fantasy. My fantasy about getting laid is the same as any young woman’s fantasy would be: I want a dead handsome, dashing James Bond type.” [Laughs.] I loved that take on it. It was just, like, “Don’t be judging her and trying to predict her fantasy without even asking her what it was.” Within the shell of the affliction she was suffering, there’s this young woman, and that was her fantasy: to spend the night in a fancy hotel with this gigolo. And then in walks Ken Branagh with a shotgun, and it’s exit, stage left, pursued by a bare bottom. RS: Dagonet! Yes! I’d just finished doing a nine-month run at the National Theater, and I’d shaved my head—I’d just had it cut—and I remember going in to meet for the audition. In the other room were the casting director, the producers, and Antoine Fuqua, the director. I remember the casting director looked at me, just aghast, looking at my head and going, “Your head can grow quickly, can’t it?” Because obviously she had the instruction to present actors who were of the hirsute, rough-looking warrior class. And I said, “Yeah, it grows quite quickly,” but it was already too late, she’d thrown me into the room. So I did my piece, I walked out, and I got it. And it was just, like, “Wow, I’m off to Ireland to shoot my first big movie!” And, indeed, it became a trademark. I think it was Ray Winstone who said, “I’ve shaved my head! We’re from the same tribe!” I said, “Okay, Ray. Yeah, absolutely.” [Laughs.] But that was great fun, hurtling about on a horse ’round the Irish countryside. A lot of fun. RS: I mean, what audacity: I’d just dropped my kid off at school in Ibiza and my phone rang at five past nine, and it was a voice saying, “Is this Ray Stevenson?” “Yeah.” “This is Billy Bob Thornton.” And because I’m in Ibiza, I’m going, like, “Yeah, of course it is. Hi, Billy!” We’ve never met. [Laughs.] “Of course it is! How are you doing?” He says, “Have they told you about this movie?” I said, “No.” So he spent the next 40 minutes explaining the movie to me, and then he goes, “Oh, and by the way, I’m offering you the role!” And what an illustrious cast: Robert Duvall, Kevin Bacon, and John Hurt to be my old man! And I loved the juxtaposition, where I play the big, hulking son who had been a prisoner of war and had been broken, and then there’s this small, slight erudite chap who is a bitter, twisted old force. So, yeah, it was great fun. [Adopts a Southern drawl.] And we filmed it down in Georgia. Yeah, we had a great time on that. RS: Well, yeah, because I think they had a stop-start, stop-start, stop-start kind of release, and no one knew when it was coming out. And people would say, “Is it out yet?” And I’d say, “I don’t know. Is it out yet? Has it come out officially? When is it coming out?” It was one of those that was faltering from the start, from the out-get. But people are still coming to the movie even now, which is a great testimony to it. RS: Ah, Clym Yeobright. Yeah, and I had—oh, my word—Catherine Zeta-Jones as Eustacia Vye, Clive Owen pre-King Arthur as Damon Wildeve, and… wow, we filmed that all down in Exeter. Who was it who did that? Wasn’t it a Hallmark Hall Of Fame? [Laughs.] Well, my mother loves that movie, so what can I say? AVC: You’ve done plenty of period pieces over the years. Do you have a preference when it comes to modern-day setting versus period? RS: Wow, what a chance! What a great opportunity that was. I mean, to work opposite the Rock, Dwayne Johnson. I’ve got about half a centimeter of height on him, but his arms are the size of my legs. [Laughs.] But what you see is exactly what you get. And to get to do this character… I mean, the entrance in the movie is, you ride a motorbike, it launches in the air, it breaks apart beneath you into four rocket-propelled 500-pound bombs as you come down off a parachute, drop the parachute, pull out two guns, and having blown this prison to pieces… that’s your entrance! And if that doesn’t sell it, then the last big fight you’re having—or that I’m having—is with Dwayne, and we’re doing, like, gun fu, with both of his sidearms and in the end getting blown to pieces with my own mini-devices. It’s, like, “Okay, if that’s the bookends of the movie, then whatever happens in between is just going to be fun anyway!” And it was. RS: Oh, God, yeah, the Punisher. I never really was aware of the comic-book world growing up in the U.K. But I went through the whole series, and reading Garth Ennis’s writing with the Tim Bradstreet illustrations, you really enter a world where he doesn’t pull his punches and doesn’t try and hide or make allowances for this character. There is no redemption for Frank. There’s no “get out of jail” at the end. There’s no light at the end of his tunnel, and he knows it. It’s very, very sophisticated writing and emotionally powerful writing, and I was just delighted to be able to have a crack at bringing it to screen. It was almost 100 percent night shoots in Montreal in wintertime, but it added a lot to it. It was a tough, tough shoot, but a great experience. AVC: You were stepping into the role after Thomas Jane had played it. Did you feel any pressure on that front? RS: Not at all. I mean, I’m sure Thomas didn’t feel any pressure from Dolph Lundgren, so I didn’t feel any pressure from Thomas Jane. You know, with these roles, you just try to make them your own, and then you never feel you’re stepping into another person’s role. AVC: You also had the opportunity to reprise the role of The Punisher when you voiced an animated version of the character. RS: Yeah! It was strange. I went up to a studio somewhere in L.A. and voiced over all these lines. I haven’t even seen it! But, yeah, apparently it’s out there in the wonderful world. AVC: Did you enjoy the experience? Because you haven’t really done much in the way of voice work. RS: Well, I haven’t, and it’s been a surprise. I mean, I’m not opposed to it, and I enjoyed it. I did some voice work when I was in London. I think you basically have to be onsite. If I was living in L.A., I think I’d end up doing a lot more voice work. Or if I was living in London, because when I was in London, I was doing voice-overs for documentaries. And I did the L’Oréal one time, doing that scientific voice, where there’s a beautiful woman who’s rubbing her leg, and you’re going, “Takes away cellulite.” And, of course, she looks like a frankfurter. There’s not a mark of cellulite on her. [Laughs.] So I was doing all that and some other things, and it’s something I’m not opposed to. But I think these things tend to get cast pretty short notice. Who knows, though? Maybe again someday in the future. But all the time we were rehearsing, he’d say, “Ray, you can go larger! You can go larger!” I said, “Ken, I’m dipping my toe in the river of ham here. You’ve got to guide me.” He said, “Ray, speaking as one who’s swam in that river many times, you’re in good hands.” [Laughs.] But you’ve got a character who wears his heart on his sleeve, the heart’s the size of a planet, and you’re essentially a Viking in space… I mean, who doesn’t want to do that? RS: I met my first wife doing that [Ruth Gemmell]. I loved Lena Headey. I had a handlebar mustache, if I remember correctly. I don’t know what on earth possessed me to go for that. [Laughs.] I think I went to Bradford, and we saw these guys with their ’staches. But it was fun working with Cathy Tyson, a wonderful actress. So, yeah, it was all about prostitutes on Lumb Lane. Lumb Lane was infamous for it, and it wasn’t that long prior to that that they’d had the Peter Sutcliffe thing, this guy up there who went ’round murdering prostitutes and what have you, so it was just bringing that out. It was a nice social piece, and it was great to do. Early days. RS: I got sent the script, and I couldn’t make head nor tail of it. I was, like, “Ancient Rome? What is this?” And I was literally finishing King Arthur, actually, and we were at Pinewood Studio, and I was hanging off sheets of ice on the back lot and killing lots of Vikings, and being killed! And then I went straight into town, straight from a day of that, and straight into the audition, where I met Bruno Heller and Anne Thomopoulos. I just dived straight into the audition, and they went, “Um…” Because I didn’t know they’d been three months looking for this character, Pullo. And they said, “What do you think of the script?” And I said, “I’ve no idea. But it’s damned intriguing! I want to read more. I want to find out more about him.” And I got it. And I embarked on a job that’s ultimately changed my life profoundly. AVC: There was to have been another season, but the story is that HBO pulled the plug on it, but with enough warning to at least sort of offer a conclusion. RS: Yeah, there could’ve been a third, fourth, or fifth season. It could’ve gone on. But HBO had a change of regime or whatever. Deadwood went as well. It suffered from the fact that when a new groom comes in, if they keep a show on, if it’s a success, it’s their predecessor’s success, and if it’s a failure, it’s their failure. So it’s kind of lose/lose for them, so they come in with their own programming ideas, and it’s out with the old, in with the new. And Rome hadn’t really actually opened officially! But, of course, as soon as they pulled the plug, it went ballistic. It went through the roof. I think they dropped the ball on that one. But by then, it had gotten me my representation in the States, and my movie career started in earnest, and what can I tell you? I’ve got no complaints. Also, I met my partner and the mother of my children there. So it had a profound effect on my life. AVC: Once upon a time, there was a Rome movie script floating around, intended to follow the second season. RS: Yeah, but I think it also suffered from too many middle-aged men trying to elbow their way in and attach themselves to what was deemed to be a potential real success. And then there were questions of ownership and all this sort of stuff, and by then the second season had been brought to a close, and actors were going on to other things. So it almost became a victim of its own success. AVC: At one point, you described it as a series where one had to leave their dignity at the door. RS: Well, yeah, I think you could say that’s a premise held by most actors on most things they do. [Laughs.] But in that one, you really had to commit and go for it and trust in the writing and in the people around you. And when you did, it bore great fruit. AVC: Was there any particular moment, be it graphic or otherwise, where you just went, “Well, I’ll do it, but only because it’s my job”? RS: That was great getting cast in Divergent and getting into that world, that sort of dystopic future. It’s the same producers as Hunger Games, great people to work for. Shailene [Woodley] is amazing, as they all are. I had a little to do in Insurgent as well, but I got to work with Olivia Williams, and oh my God, if you’ve got to work with somebody, you could do worse than to get to work with her. We were cracking up on and off camera. It was too much. They had to calm us down to shoot the scene. She was brilliant. And I’ve literally just gone and shot a couple of days in Atlanta on the new Allegiant movie, because I finally get to meet my wife, who is the incredible and amazing Naomi Watts! So I was flown in to do these intense scenes with her, so it was just, like, “Yeah, I’ll turn up for that. Yeah, sure, I’ll do that.” [Laughs.] It really was great. I’m delighted to be part of that. AVC: In addition to your various franchises, you’ve also got Black Sails to keep you busy. RS: Yeah, I’m going back now! We’ve got season three coming out in January, and of course I starred in season three, but we’ll be starting season four in November, and I think I’m doing the first three episodes of season four, so I get to don the black beard and the hat and the guns and the coat. I mean, again, when I was offered the role, apart from the part being Blackbeard, what sold me was watching the making of Black Sails and seeing the production values there. They are through the roof, and it reminded me of the production values we had in Rome: You see the money on the screen through the costumes and the props department and the weapons. It’s a great piece of work, so I’m delighted to be a part of that. AVC: Do you have a favorite project you’ve worked on over the years that didn’t get the love you thought it deserved? RS: [Hesitates.] Three Musketeers. Again, it suffered from not really knowing how to pitch it. The marketing campaign was… I don’t know what happened, but it was a bit off, and it didn’t do well at the box office in America. There was no advertising in Canada, and we did higher box office there. And immense box office in Japan. Around the world it proved to be a hugely successful movie, but it’s seen as a bit of a pariah in America because it didn’t do well here. Well, I’m sorry, but it’s a huge movie. And people are still coming into it now and going, “How come I never saw this?” And you go, “Well, again, it’s forces out of your control. The studio got confused, they don’t know how to pitch it, so they kind of missed the pitch.” It’s a very skilled profession, and it can make or break a movie. So I was very disappointed that that one didn’t get sold right, because I thought—and still do—that it’s a great piece of work. I’ve got another piece that I’ve just finished filming in South Africa called Saints & Strangers, for Sony Pictures and National Geographic. It’s a four-part miniseries about the authentic telling of the Mayflower landing in 1620 and setting up the first colony of pilgrims and strangers. It’s gonna rewrite history, because it’s drawn directly from the real historical facts and events. They’re gonna be showing it around Thanksgiving, and I’m very much looking forward to it. We literally just finished it the day before yesterday, and I can’t wait to see how it comes together. I know that Sony and National Geographic are very excited about it, and it’s been one of those blessed projects, so I’m very excited about it coming out. AVC: And since they don’t list a character by your name on IMDB, which pilgrim do you play? RS: Well, I don’t play a pilgrim. I play a stranger. RS: [Laughs.] I play a guy called Stephen Hopkins. You can look him up on Wikipedia. In the New World, he didn’t set up a construction business or gas and oil or start farming. This guy opened a pub. So I automatically liked him! And I think one of his grandchildren was one of the signers of the Declaration Of Independence. So it’s a tremendous piece of history, and as I say, we’ve just finished, so I’m still reeling from it. But a lot of work’s gone into it, so I can’t wait to see how it turns out.